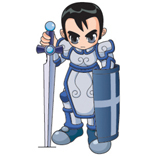 No9, a CON knight, hit level 52 in February. I interviewed her then, but my notes got lost somewhere in the recesses of my computer until now! :) She hails from Tokyo, Japan and with the help of translator, Reona, the princess of her pledge, I was able to have a chance to meet her. No9 has been playing lineage for almost 2 years now. She thinks the best place for a knight to hint is Fire Valley, where she takes her two level 27 beagles, Koduck and Musashiv. These beagles aren't hunting dogs, they're actually just very cute potion carriers with 200HP. Why beagles? "Because they're pretty". Yes they are! No9's pledge is a hunting pledge, and she hunts bosses often. It's no wonder, thanks to a +6 Helm of Magic Resistance, her pair of Immunity to Magic rings, +5 Silver Knight's Shield and +6 Blessed Cloak of Magic Resistance, her MR is at 92%. She also added +1 to DEX at both 51 and 52 and wears an Amulet of Dexterity. She says it makes killing bosses much easier. When I interviewed her, the reduced XP loss on death was one of the newest updates to Lineage, which is actually quite an important change for her. You see, in June 2002, she was the second person in the US to have a level 50 mage, Kurei3. However, the challenge of keeping a mage alive was enough to have her start No9. Now that you don't lose so much any longer, she thinks she's going to use No9 for boss hunting with her pledge and go back to working on Kurei3. By far.. one of the nicest people that plays Lineage. damn, lvl 52 knight & lvl 50 mage in 2 years.... nice work! Gratz Kurei-senpai (:P)!!! 2nd lvl 50 mage on servers and a lvl 52 knight @. @ G/J and G/L on your next lvl!!! If Amer's dog looks stoned imagine what amer is like? T.T lol j/k. Its nice to see people on Ken that don't sell their accounts when they hit 52 -.-;. Thats a cool dog Amer, kinda looks like my dog! Hehe. 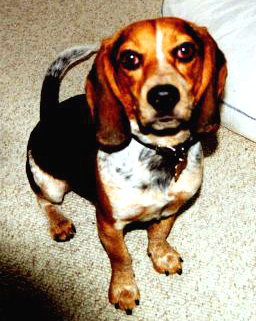 I hope she is so cute as her beagles =) Grazts. Me luvs beagles I got 1 irl. Very nice. The dogs are cute. She has a lot of drive for 2 level 50+ char's. And the 92% mr is nuts. She must have good ac to because she has good dex. only after August 2001 i think soulfire. if you had an account before then you are allowed to keep it. nah, just the post-beta korean IP's are blocked. anywhere else is playable. h2ombre has it - after August 2001, if there is Lineage in your area, you aren't allowed to sign up on the NA servers. See you in FV frequently. One of the friendliest and most polite players on Ken. Best of luck leveling mage. Amer's dog looks like Beagle/Cerberus mix... check out those fiery red eyes! incase you guys are forgetting kurei3 had the best possible stats for any warrior mage! 20str 18con 14dex~ 7int 8wis i think~ this is truely a unique mage~ if he lvls it to dk or higher imagine the power behind its staff. congrats =) you are a very nice person and it would be cool if you had a 52+ mage to go with tthat knight =) maybe it'd be a first in the us? can any1 correct me on that one? While I've been away for several months, and may be for a few more, it was a pleasant suprise to come here and see my good friend No9 finally get a well deserved spotlight. The first time we really met, before I actually knew that she was also Kurei3, was when I was leveling my Knight, Tharien. We both ran into a pair.....yes, pair of Ifrits in FV, and worked together to end them, with the healing help of her R/L husband. As I was fortunate to get the best of the drops, I of course shared them with the 2, as it was a team effort, and a strong friendship was born!....Congrats on the Spotlight!